Golden Sunshine offers a complete line of natural skin care products in Olathe, Colorado, to keep you looking and feeling young. They are unique formulations, processed with care to ensure the finest quality and results for your health and beauty needs. 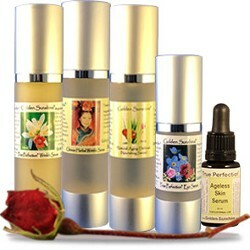 These all-natural skin care products come in three basic categories: a natural daily cleansing and moisturizing regimen, a facial rejuvenation regimen that promotes anti-aging benefits, and an assortment of facial enhancement blends and fragrances for an all-natural approach to daily living. 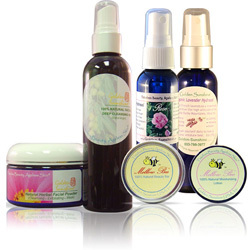 Our natural skin care regimen is great for cleansing and moisturizing the skin. It also helps with a variety of dermatological problems, including psoriasis, eczema, and dermatitis. Our facial rejuvenation protocols use collagen peptides, the building blocks of healthy skin and hyaluronic acid (the body's synovial fluid), the body's own natural moisturizer. These protocols also include a combination of aloe and Chinese herbs to nourish and repair the skin. 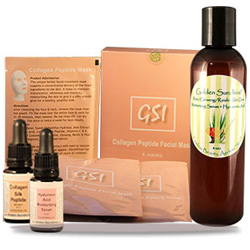 In addition, Golden Sunshine has developed anti-aging skin products for specific indications, such as wrinkle serums and maintenance products to keep you looking young. Top off your beauty arsenal with natural fragrances to replace commercial alcohol-based perfumes. Your skin will love you for years to come. If you are performing facial rejuvenation in your practice, or considering doing so, contact us for a FREE personalized Facial Rejuvenation Protocol on PowerPoint that can be used in lecturing at local events to promote your practice or in the office for patient education.